It's been a busy weekend in our household. Not only we had two friends staying with us, Maya had her own doggie guest as well. 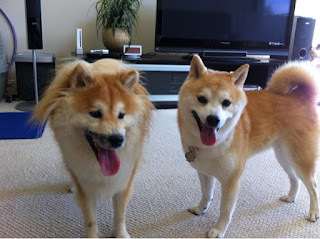 Tachi, another Bay Area Shiba Inu who we met at a meetup, came to stay with us while her owners went on an overnight trip. Tachi is already 8 years old, but still super active and fit. I was a bit nervous since this is not only our first dog-sitting experience, it's also the first time another dog enters Maya's territory. Before Tachi came over, I made sure to put away all of Maya's toys, food, and water bowls. When they arrived, we took Maya downstairs to greet them, and all went for a walk in the park. They were excited to see each other and walked nicely with each other. Then we took them both back home. We let Tachi explore the area while keeping Maya on leash. Maya didn't seem to mind the intruder at all! Once we let both dogs off leash, they started to play right away. Besides eating, sleeping at night, and when we had to leave the house, they spent the entire two days together. I was surprise how well they get along. On the second day, they acted as if they lived together for a lifetime. It's a bit scary at first when we saw how rough they play with each other, but they've been communicating pretty well. They would pause for a synchronized Shiba shake or stop for a water break together, and agree on another round of play with a glance. They even made the kitchen area their designated timeout zone, and would stay there when either one needs some rest. Maya has been a bit less itchy in the past few days and Tachi's company seems to help take her mind off of it as well. It's great that she was able to enjoy some cone-free play time. It's been a great experience to see how well Maya treated her guest. It gave me much confidence that we are able to handle two dogs if we ever decided to get another one. Time for a better camera? Ooh, this is absolutely GREAT to see especially since you're considering a second dog. ;) Tachi looks adorable. And I hadn't thought about a good playmate being a valid distraction from itching, too... But that does make a lot of sense if half of itching is just an OCD sort of response, exacerbated by a wandering mind... Oh look! Puppy! Play!